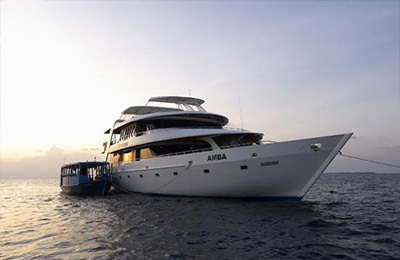 DHINASHA Surf Charter - Maldives, Male Atolls Guests overall rating: ☆☆☆☆☆ 0 based on 0 reviews. 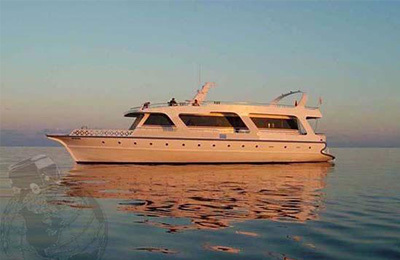 Enjoy the exquisite beauty of the Maldives at up to 14 knots on board the 90 ft. Dhinasha motor boat charter. And should you need a break from the scenery, you can pop down below deck to one of the eight air conditioned cabins or fire up the entertainment centre to suit your mood. 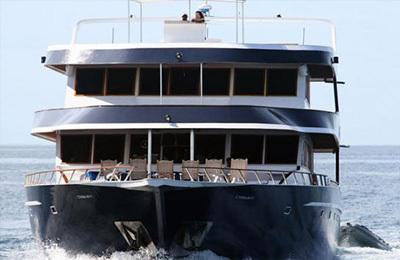 Apart from surf, the Dhinasha is equipped with snorkelling and fishing gear, offering everything a true adventurer yearns for. Hot & Cool Fresh water. Kitchen is fully equipped for international cuisine and chefs are well trained and experienced to cater for the most demanding clients. In general the Maldives rely on the same swell as Indonesia with the best and most consistent swells coming from April to October. Swell size will likely peak from June to September when south swells from the southern Indian Ocean make their presence known on most of the exposed breaks. This is also the time of the southwest monsoon and many of the spots can see offshore conditions. The waves will normally range from 4-8 feet, with occasionally bigger days. February and March, considered the early part of the season will see fun surf and more stable weather but swells will vary, arriving in the small to medium size range. The same holds true for November when the season is coming to a close. The North Male Atolls have been popular with surfers for quite some time thanks to a variety of spots that stay fairly consistent, especially in the prime summer months when south swells are in abundance. There is an assortment of spots scattered around these idyllic islands ranging from long points to hollow sucking barrels that can accommodate all levels of surfing. Although west to southwest winds are the norm at this time of year many of the breaks in this island reef chain are well protected and will remain clean, while others will be offshore. Crowding can sometimes be an issue because of the relatively easy access of the breaks courtesy of the many boats in this wave rich zone and due to the resorts that shuttle surfers out to the breaks. “Chickens”: Long, peeling left pointbreak that is very fast. “Cokes”: More of a big wave spot with a nice barrel on the take off that doesn’t let up. Likes a mid to incoming tide. “Lohi’s”: A lefthander that gets super hollow on a big SE swell. “Ninja’s”: Mellow righthander which is perfect for beginners and long boarders. “Pasta Point”: The celebrity wave of the Maldives is a really, long tubing left which picks up more swell. Has two challenging sections knows as “Macaroni Bowl” and “Lockjaws”. “Sultans”: A first class righthand point and one of the more consistent waves in the area. Has a nice take off and a super long wall with a great end section. Will peel for up to 150 yards. “Honky’s”: Another long left hander that jumps in size as it turns and peels down the reef. Plenty of tube sections. “Jailbreaks”: Super good righthander which can break up to 300 yards long on the right swell. At the moment surf charters exploring the Central Atolls have focused on the Meemu, Thaa and Laamu Atolls, each one offering a variety of waves. All three atolls have great exposure to south swells and there are plenty of reef-pass setups that will often see bigger waves than the more popular North Male Atoll. Numerous world class breaks have been discovered in the Central Atolls, mostly in the form of right-handers. The beauty of surfing these island chains is that there are many spots within a short distance of each other and waves that will accommodate every level of surfing. So if you find a reef sucking barrel that looks rather intimidating, you’ll likely find a more welcoming and forgiving wave just around the corner or on the next reef pass. Naturally some spots might be more exposed to wind, but the layout of these islands and their accompanying reefs means that many breaks will be protected, ensuring clean conditions. 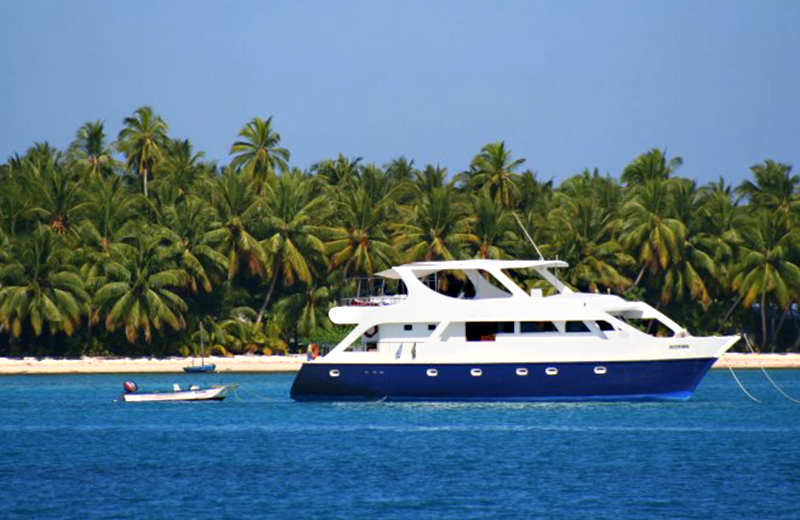 As the only means of access to these atolls is by charter boat, those lucky enough to have ventured there have been reaping the rewards, and with nobody else around. Crowding is not an issue in the Central Atolls!! “Mulha Rights/Lefts”: the right is tame and good for beginners and intermediates, while the left is faster and more fickle, only breaking when conditions are just right. “Muli Inside/F1”: a fast barreling righthander with long walls. Tends to want a bigger swell to get going. “Adonis”: a righthander that has some very nice barrels when the swell jumps up a notch. It can be a very long wave with the right conditions. “Outside and Inside Mikados”: a very powerful righthander that can produce some great barrels and will pick up more swell than other spots in the area. “Langon Bank”: a righthander that needs a big southeast swell. It tends to be a pit stop for charters boats heading south. “Tsunamis Lefts”: has a tendency to close out but can be a fun wave if Tsunamis Rights is too small. “Tsunamis Rights”: an excellent wave with the right swell angle offering three super fun sections. Has a sweet barrel on the takeoff, then a fun wall for some turns and another barrel at the end section. Occasionally currents can be a factor at this break. “Refugee’s Left”: a heavy left that closes out more often than not. “Refugee’s Right”: a challenging wave that is fast and shallow on the drop before it barrels down the reef. “Ying Yang”: one of the most consistent spots that loves a solid southeast swell. The wave starts out fairly tame with a nice wall before it backs offs for a while and then begins to throw, offering a long inside section that is quite challenging as it produces some incredibly hollow barrels. Sitting in the Indian Ocean the Maldives are a group of coral islands straddling the equator southwest of India and west of Sri Lanka. There are about 1,200 islands and roughly 200 of those are inhabited. These low lying islands, isolated reefs and sand spits make up part of a larger formation of 26 atolls that formed around the edges of sunken volcanic peaks. Ring shaped and situated atop a submarine ridge that runs from north to south, the atolls cover an area of approximately 90, 000 square kilometers. The average size of the islands is only one to two kilometers in area and most are flat with white sandy beaches, crystal clear reefs and deep blue lagoons. They sit just 1.5 meters above sea level, and with the highest point being only 2.4 meters above sea level, the Maldives are considered the flattest country in the world. There are many places around the globe that surfers would define as paradise and the Maldives is definitely at he top of the list. As a destination for surfing perfect waves over a crystal clear reef in a tropical setting it doesn’t get much better than this. When Tony Hussein first came upon these islands in 1973 he was thinking the same thing yet the word didn’t get out for another 15 years about how good the Maldives really were. Eventually his discovery made its way through the surfing community and the Maldives were no longer just a destination for diving. These idyllic tropical islands slowly began seeing a steady influx of surfers and they haven’t stopped coming since. While breaks in the northern atolls have gained most of the attention thanks to several resorts and charter boats that offer easier access, the central and southern atolls are where new discoveries are being made. The best way to reach these more distant locales is by charter boat, and while it might take just a bit longer to get there, you and your mates will likely be the only people in the water. The Maldives have a warm, year round tropical climate and is influenced by two monsoons courtesy of the Indian subcontinent to the north. The southwest monsoon from May to October, called “halhangu”, will tend to see more wind and rain, while the northeast monsoon, called “iruvai”, from November to April is the dry season with little or no wind. But due to the Maldives location on the equator, the monsoons are mild and do not always conform to the monsoon patterns of the Indian subcontinent. The temperatures range from 25°C (77°F) to 33°C (90°F) throughout the year and there is an abundance of sunshine in this tropical paradise. That being said, the tropics can see its share of foul weather and tropical storms are rare but not unheard of during the summer months. The water temperature remains at about 26°C (80°F) all year round. – Male Airport: 67 USD per person Contact us for Availability!! !